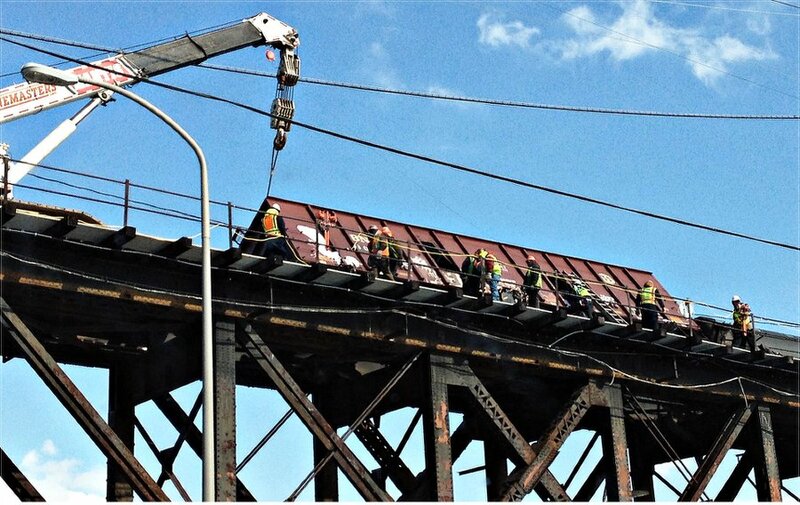 Derailed train dangles over West Philadelphia. 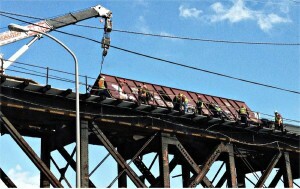 Philadelphia — On Jan. 20, seven cars of a mile-long freight train operated by CSX Corporation and carrying Bakken Shale crude oil, derailed on a bridge over the Schuylkill River in West Philadelphia. The densely populated area nearest the bridge is home to two major universities, two hospitals, plus thousands of apartment buildings and residential homes. It also borders Center City, Philadelphia’s major business and commercial district. While no explosion resulted from the derailment, similar cargoes of crude oil — described as “oil bomb” trains — have exploded and burned in five other crude-by-rail accidents in the last seven months. On July 6, 47 people were incinerated and dozens of buildings destroyed when a fireball erupted after a train carrying crude oil derailed in Lac-Megantic, Quebec. Fires and oil spills, but no loss of life, resulted from derailments of trains carrying crude oil near Edmonton, Canada, in October; in rural western Alabama in November; and in northwest New Brunswick, Canada, on Jan. 7. On Dec. 30, a freight train carrying Bakken Shale crude oil collided with another train in Casselton, N.D., 20 miles west of Fargo, resulting in a fiery explosion. It forced the evacuation of 1,200 residents within a five-mile radius due to the danger of exposure to fumes from burning crude oil. But evacuating tens of thousands of residents within a five-mile radius of the CSX rail bridge in Philadelphia would have been impossible. It can take more than five minutes for a single train, carrying around 100 cars, to pass by any given location. There is no limit to the number of cars allowed to carry crude oil. Trains similar to the one that derailed in Philadelphia run through several major U.S. cities, including Chicago, Minneapolis/St. Paul, Milwaukee, Kansas City, Topeka, St. Louis and Memphis. On Jan. 16, more than 400 people packed a community meeting in Washington, D.C., to protest plans by CSX to dig a massive trench less than 50 feet from a residential area in order to carry uncovered freight trains containing crude oil and other hazardous materials. Federal right-to-know laws exempt shipping companies like CSX from having to disclose what hazardous materials they carry. While CSX has a “voluntary agreement” with some cities that it won’t move “unit trains” — those carrying only one type of hazmat cargo — it easily gets around that rule. In Philadelphia, one of the seven cars that derailed was carrying sand. More often than not the additional railcars carry highly inflammable materials such as propane. In 2013, CSX reported 212 accidents — 99 of them from derailments. Sixty-four others involved cars carrying hazmat cargo — the highest number for any railroad company in the U.S. These accidents can be linked to the rapid and largely unregulated expansion of shale oil production using hydraulic fracturing. Since 2008, domestic oil production in the Bakken Shale region of North Dakota and Montana has increased by 50 percent, producing up to 7.5 million barrels per day in 2013. At the highest levels since 1988, oil production in Canada, North Dakota and Texas has exceeded existing pipeline capacity, resulting in a 400 percent increase in crude-by-rail shipments since 2005. The North Dakota Mineral Resources Department estimated that in 2014 around 90 percent of the state’s crude oil — almost 1 million barrels per day — will move by freight rail. This also surpasses the estimated capacity of the Keystone XL pipeline, which is only 830,000 barrels per day. There is an added concern that oil from the Bakken Shale may be more explosive than other types of oil because it contains chemicals, including volatile organic compounds, used in the hydraulic fracturing process. The fracking chemicals may also be the cause of severe corrosion found on the inside of the tanks, covers and valves of derailed cars carrying shale oil. For nearly 20 years, the U.S. National Transportation Safety Board has issued safety guidelines recommending that all tank cars used to carry crude oil be reinforced to prevent punctures should they derail. They have been particularly critical of the thin-skinned and easily explosive DOT-111 railcars that have been linked to some of the deadlier disasters since 2009. A key problem is that while the NTSB can make recommendations, it lacks the authority to mandate that the industry use either DOT-111 cars manufactured under a new code since October 2011, retrofit existing cars, or take the hazardous railcars out of service. It is estimated that modifying the DOT-111 rail cars could cost up to $3.6 billion — an expense that would be passed on to the oil industry and other shippers. (Bloomberg News, Jan. 23) However, rather than use a small portion of their megaprofits to pay for safer rail cars, the energy industry is using the rail disasters to argue for expanded pipeline production. Proponents for the expansion of the Keystone XL pipeline have been quick to capitalize on the recent surge in train derailments to argue for approval of this widely unpopular construction project. However, Anthony Swift, an attorney for the Natural Resources Defense Council, which opposes the construction, points out that the Keystone XL is intended to carry tar sands oil from Canada, oil which is heavier and more expensive to move by rail. Swift notes that energy companies in the Bakken Shale prefer transport by rail since it is more flexible than pipelines. Therefore, shipments by rail are not likely to decrease even if the pipeline is built. The rate of overall pipeline incidents has also doubled since 2000. Data collected by the Pipeline and Hazardous Materials Safety Administration documents 1,887 pipeline accidents between Jan. 1, 2010 and March 29, 2013 — an average of 1.6 incidents per day. As with increased train derailments, the growing number of pipeline incidents can be directly linked to the expansion of domestic oil and natural gas production due to fracking. Whether it is safer to transport Bakken crude oil by rail or pipeline is the wrong question to be asking, when there are clearly viable alternatives to domestic gas and oil production. Shale gas and oil production, especially in the Bakken region, releases massive amounts of methane gas (CO4), further increasing the risk of global warming. It also drains resources away from the development of renewable, non-fossil-fuel-based wind and solar energy. In 2013, to raise public awareness about the danger of transporting crude oil by rail through densely populated areas, environmental groups — including “350 Maine” and “Maine Earth First!” — led protests and risked arrests by physically blocking trains transporting Bakken crude. The environmental groups want a moratorium on the transportation of crude oil by train through the state of Maine.